Our 24th Street Manhattan store was feeling left out, so here’s a fairly recent (and fun) video shot there. I’ve been a customer of Olde Good Things since the beginning of your business. I love your company. I rely on you as an excellent source for all sorts of difficult-to-find beautifully designed items. I just watched your tape of the NYC 24th Street store and I need to let you know: please do NOT sell yourselves as “dumpster-divers” who dig up old junk that nobody wants! Your company is so much more than that. Fads come. Fashions go. 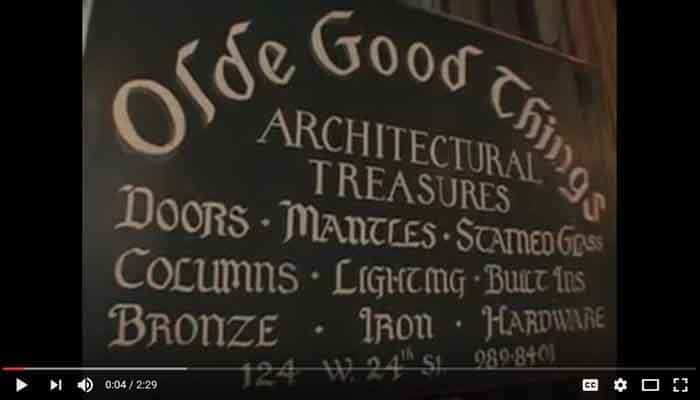 Olde Good Things saves items of quality and recycles them so that designers and collectors can work with items that are superbly crafted, totally authentic and (when working with traditional architecture and design) always far better option than some ersatz moderne refabrication. If you sell yourselves as junk-dealers? People will treat your treasures as junk. The great designer Billy Baldwin once said: “Parents: if your kids don’t like your furniture? Put it in storage. Your grandchildren will love it!” Mr. Baldwin was right. But people today don’t have the room or the patience to store their old good things. That’s why we must come to OLDE GOODE THINGS: to find those treasures that should have been saved, that MUST be saved… but weren’t. Surely, this spin is a far better take on what you do. As a constant buyer, I want your store to succeed, and it’s much better to view yourselves as CURATORS than as junk-hounds.